With more than 60 feet between herself and the jungle floor, senior field staff member, Ruth Pillco Huarcaya, presses all of her weight into one of the footloops hanging from her harness. She’s another foot higher now and, secured by a Croll chest ascender, allows the long climbing rope to support her for a moment while she calculates her next move. It’s been a tiring ascent – but that’s only half the battle. She still needs to perform a safe descent. As she unclips a rope from her chest ascender, a voice bellows from below and coaches her through the next steps. Wildlife cameraman and climbing instructor, James Aldred, from Canopy Access Limited, has been conducting a Basic Canopy Access Proficiency (BCAP) course at the Manu Learning Centre (MLC) for the past two weeks, training a select group of staff and volunteers on how to safely climb trees – and even perform a canopy rescue. It’s not everyday that members of the Crees community make their way into the trees here in the Amazon, but one project in particular has its sights set at an arboreal level. Tree Top Manu is a unique research and monitoring programme that is led by Andy Whitworth, Crees’ Research Manager who was, at the time of the project’s conception, a PhD student from the University of Glasgow. As part of his PhD and in collaboration with his now alma mater, Andy ran the first Tree Top Manu project in 2012. Accompanied by a group of students from the University of Glasgow, Andy trained the students to climb trees and oversaw the installation of eight high canopy camera traps. Senior field staff member, Ruth Pillco Huarcaya, makes her ascent up a tree in the MLC Reserve. Photo by Katie Lin. Intrigued by the results, the number of camera traps jumped to 63 for last year’s study of both the mid-story and canopy – and this year, Tree Top Manu will be installing an unprecedented 80 arboreal and 40 terrestrial camera traps, making it the first canopy monitoring project of this scale in the world. Bushnell camera traps equipped with infrared motion sensors (necessary for documentation at night) are being installed at a total of four distinct locations that are either inside of the cultural zone of Manu Biosphere or in Manu National Park, and that are either protected or not protected. This variety is important to the research as certain circumstances or conditions of a location, such as whether or not there are hunting communities or loggers in the vicinity, can affect animal abundance and behavior – and understanding and monitoring animal behavior and movement patterns is one of the main focuses of Tree Top Manu. “A couple years ago, we had one of the trees here capture spider monkeys – a black-faced spider monkey, an endangered species – showing nocturnal movement patterns,” says Andy. The camera traps also provide researchers with a rare glimpse into the habits and physiology of more elusive species, such as the kinkajou, porcupine, and pygmy anteater. In addition to the expanded number of sites, this year’s camera traps are not only going to be installed high up in the canopy and at ground level, but fruit fall traps are also going to be placed directly underneath the canopy, which the research team hopes will provide them with more information about fruiting cycles. 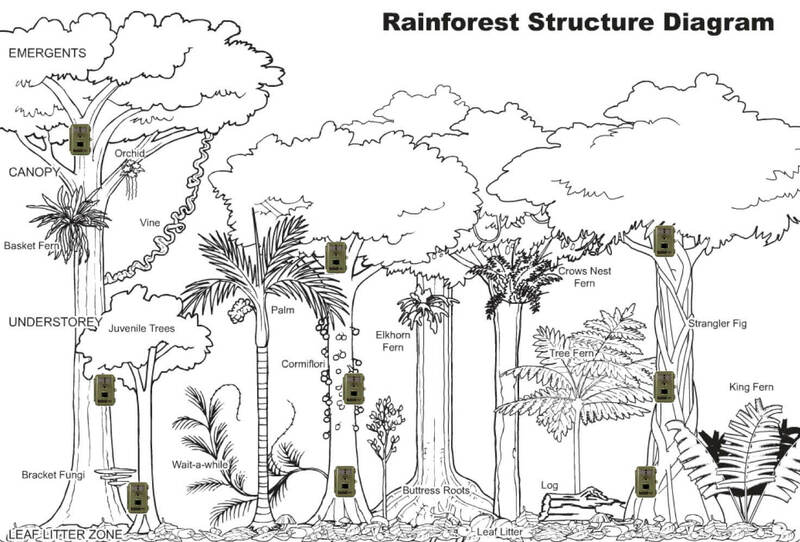 A diagram showing the full range of camera trap placement in the rainforest. For all of the interesting data that these camera traps yield, however, it does come at a cost. Progress on the ground can be slow going, with teams averaging just 3-5 camera installations per day. “The physicality that this project requires is makes it challenging – the rope bags are heavy, the terrain is often difficult, and it’s difficult to fire lines and get ropes over. That’s actually one of the toughest parts,” explains Andy. And having a capable, hard-working team in place is essential. For camera trap installation at the project’s first two monitoring sites, Andy set out with crees staff members, Laura Braunholtz, Tabi Ewing, and volunteers, Jozzi Deacon, and Fraser Norris. As for the final two monitoring locations, another four crees members will be joining the Tree Top Manu team: staff member, Laura Allen, and Conservation Interns, Colin Giraud, Hannah Gordon, and Sami Michishita. “I want to make Tree Top Manu accessible to more people but it’s difficult not having people trained. As the size of the project and its installation team grows, Tree Top Manu is also gaining notable exposure. Both Andy and Laura have given presentations at the Royal Geographical Society’s Explorer Conference and the Scottish Tropical Ecology and Biology Conference, respectively, and most recently, Tree Top Manu was featured in the March issue of BBC Wildlife Magazine. 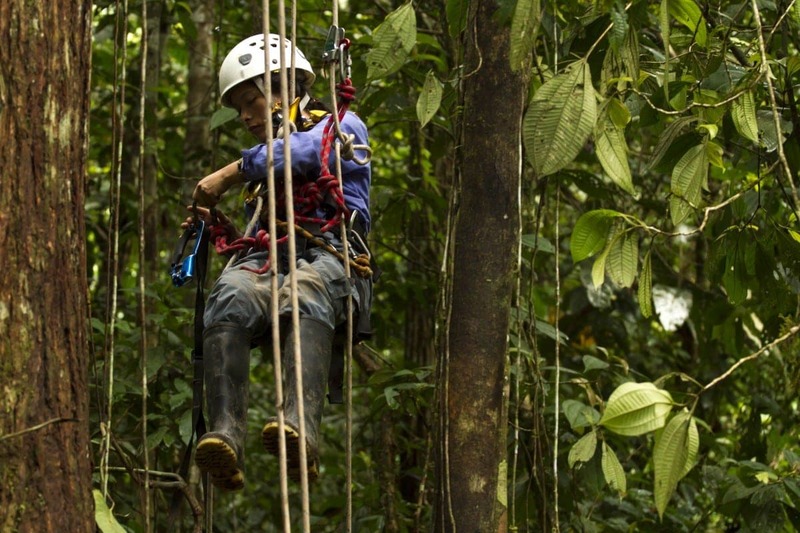 While Andy hopes to expand the Tree Top Manu team to include more crees interns and volunteers in the future, for now, the experience of climbing up into the Amazonian canopy is a rare and exclusive one. “There are days when it’s just miserable. If the sweat bees are out and you’re hot and you’re tired, there are places you know you’d rather be!” Andy says, with a laugh. Text by Katie Lin. Feature photo by Marcus Brent-Smith.